The content of any lesson plan is vital but there are multiple opportunities for your students to access that content. They can read, watch a video, go to a museum. So why is it that they should come to your classroom to learn? What is it you’re offering that’s essential to their learning and growing in your field? To start, you need to create a positive environment. An effective educator does that by building rapport with their students. That’s what Pamela Pollock, Associate Director for Professional and Scholarly Development at Harvard’s Derek Bok Center for Teaching and Learning, believes. She unpacks the importance of building rapport and how educators can do this in the Teaching and Learning Strategies for Higher Education online short course. Read on to find out how she believes you can build rapport with your students. Why is it important for educators to have rapport with their students? If your students know you and believe that you care about their learning, they’re more likely to forgive you for any missteps. Getting to know your students also enhances your ability to create a successful learning environment. In the process of getting to know them, you’re communicating that you care about them and their success. Additionally, knowing about their backgrounds and interests allows you to tailor your approach. For example, if you find that there is a great discrepancy among the class in background knowledge, you may be able to arrange students into groups to help each other. If you know your students’ interests and backgrounds, you’ll be better able to choose examples that resonate with them. How do you build rapport as a teacher? In order to build authentic rapport you need to focus on yourself, the individual students and the group. Here are some things you can do on the first day of class that will set you up for a great semester, and that you can continue to build on over the course of the class. What do you find genuinely interesting about this course, and what are some of your other interests? Focus on how students can contact you so they feel confident you’re prepared to prioritize their learning experience. It’s also important to set communication expectations: you don’t have to be available 24/7, but it’s important to let students know what to expect. Responding promptly to students, as well as giving timely feedback on assignments will also help them trust you. You’re setting expectations for them as students and it’s exceptionally important that you stick to the expectations they have for you as the teacher. Remember you may be nervous as a teacher, but the students may also be nervous about a new class, new teacher, and potentially very new material. Breaking the tension right away can put everyone at ease. Give your students opportunities to work with each other by asking them to move around and work with different partners throughout a session. 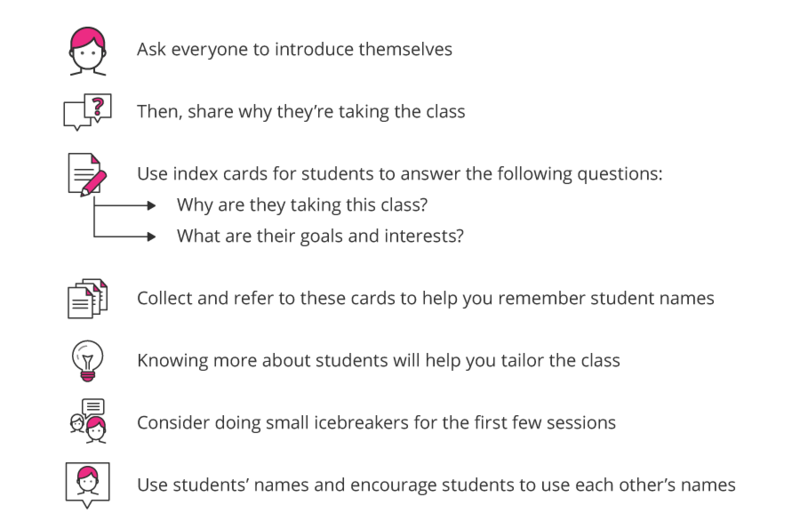 This is especially important for discussion classes, or sessions that require a lot of participation; be sure to start with icebreakers to get things comfortable. It can be as simple as having students introduce themselves to a partner and then introduce their partner to the larger group. If you’re interested in how you can apply the most relevant teaching techniques to your classroom find out more about the Teaching and Learning Strategies for Higher Education online short course.